Selle SMP's revolutionary ergonomic design developed for high performance racing saddles is now available for the recreational rider and commuter with more padding, even better support and a lower price tag. 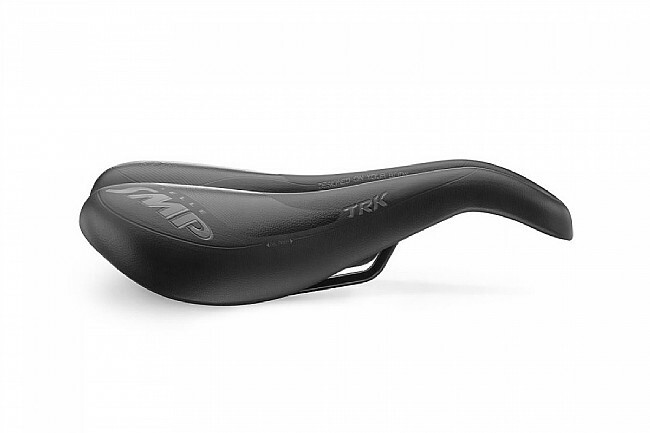 The Men's TRK Gel saddle uses the same unique, soft-tissue-friendly shape as the rest of SMP line -- the wide cut-away and dropped nose relieve pressure and promotes blood circulation. The extra wide back offers excellent support, while thicker foamed polyurethane padding provides plenty of cushioning. This Gel version includes a self-modelling GEL insert that conforms perfectly to the rider to reduce pressure by 30%. Designed for comfort in a more upright riding position. 280mm Long x 160mm Wide. 485 grams. Steel rails. Made in Italy. comfy but the seam a the bottom ridge is eating up my shorts!!!!!!!!!! !